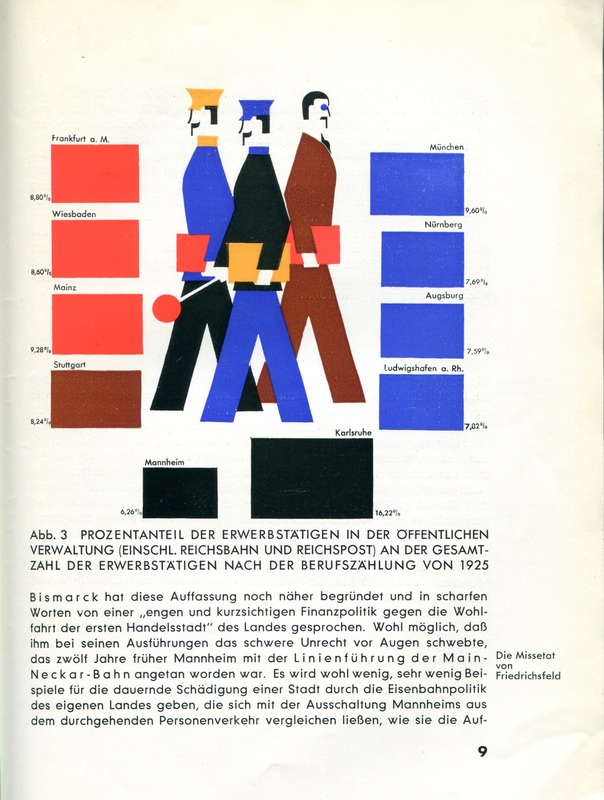 Germany’s adoption of the Weimar constitution after the end of World War I brought democracy, universal suffrage and far greater citizen involvement than had previously been the case. Progressive municipal leaders saw an urgent need to educate the general public on matters of public administration and the role of government. 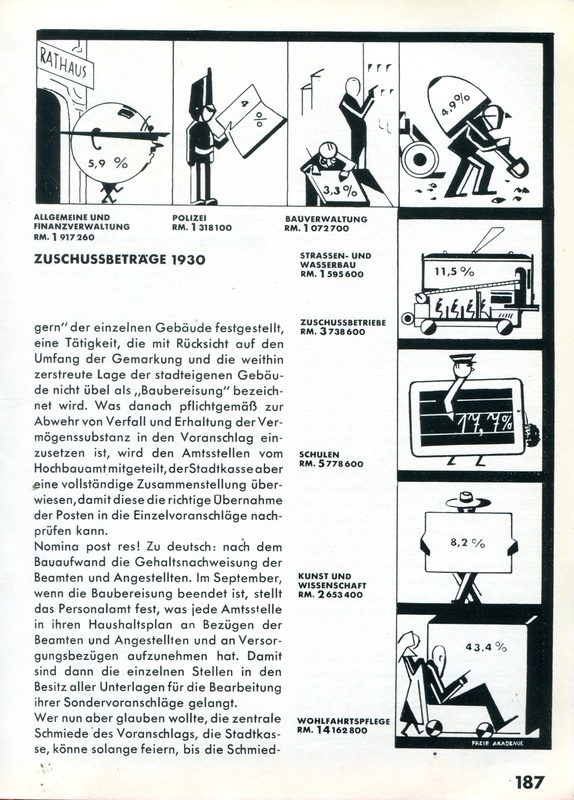 To this end, many German cities established public affairs offices,which, among other things, generated educational materials on the activities of the city administration. 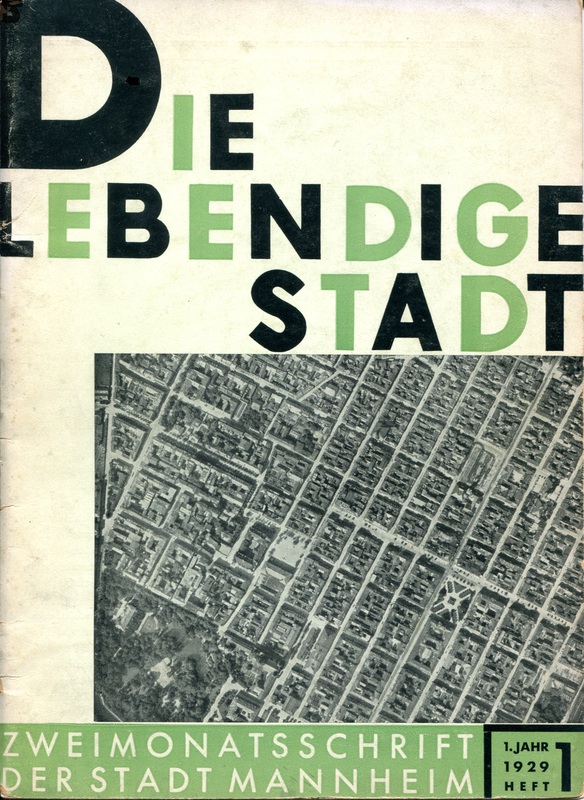 “The Living City,” the quarterly magazine of municipal affairs edited by Johannes Höber, 1928-1930. The first job my father, Johannes Höber, had after he finished at Heidelberg University was heading the public affairs office for Mannheim, a city of half a million. The city’s Social Democratic administration supported active economic, cultural and social programs to improve the lives of its citizens. Johannes edited numerous reports and periodicals to spread the message about the city’s activities. 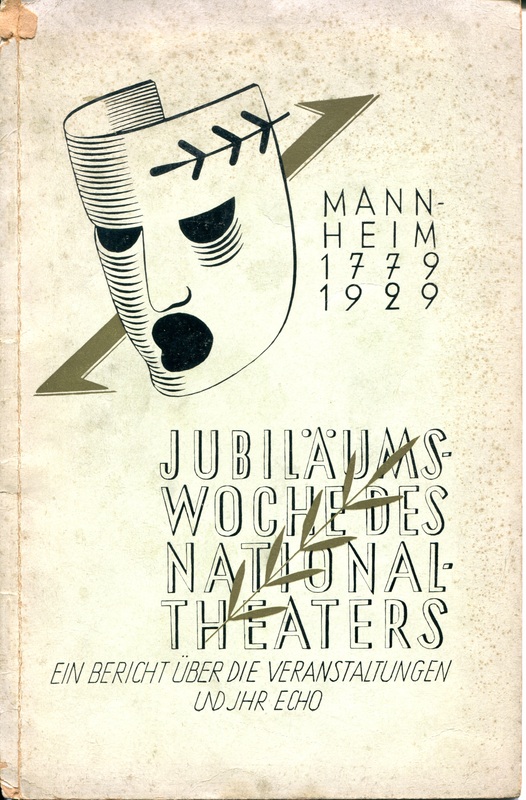 Program for the commemoration of the 150th anniversary of the national theater in Mannheim, 1929. The publications Johannes edited featured dramatic graphic representations that attracted the reader’s attention and presented information in a clear, engaging fashion. Sometimes the graphics were a bit strained, and then deciphering them became its own kind of entertainment, as in the following article on the increase in expenditures for various city services. 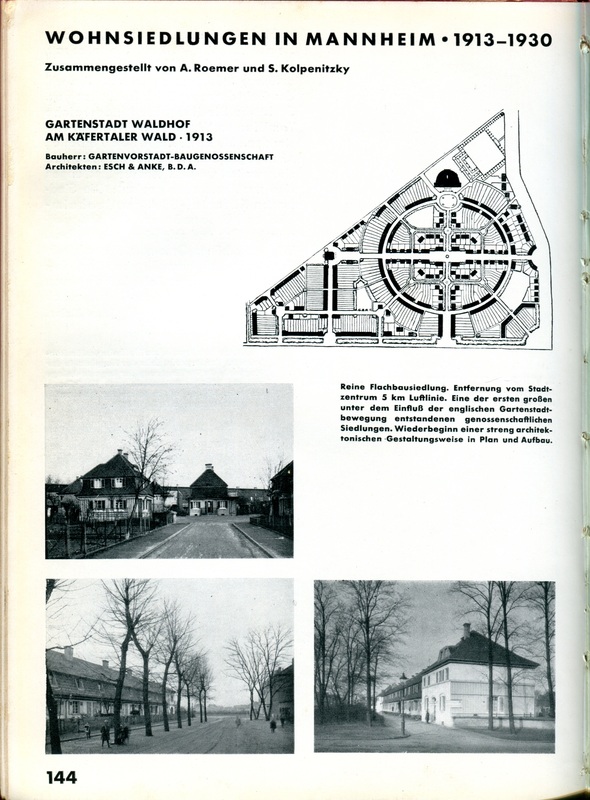 Font selection, well-composed photographs, diagrams and good page layout were thoughtfully addressed, as in this magazine article on housing developments in Mannheim. This eye-catching graphic compares the percentage of the total workforce in various cities that was employed in public service. 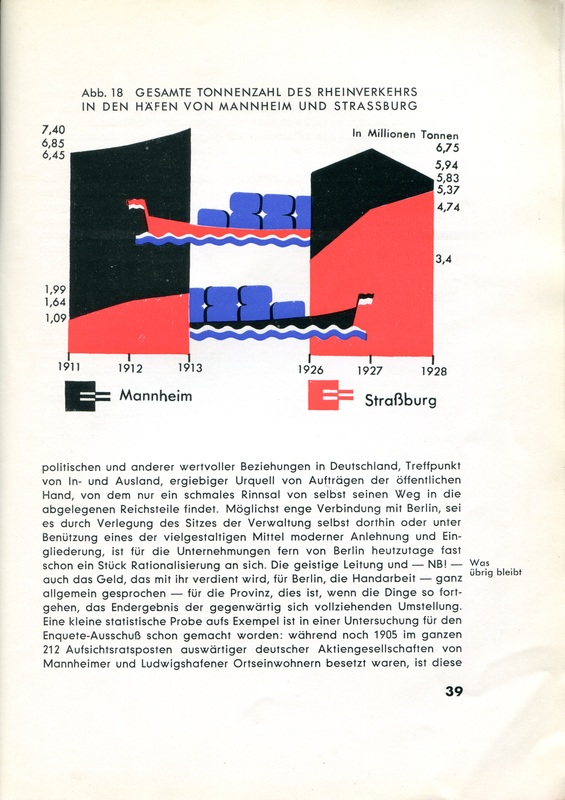 Although the Social Democrats were proud of the services Mannheim provided, public workers made up a smaller percentage of the workforce than in other German cities. When Johannes fled Germany in 1938, he carried only two small suitcases. 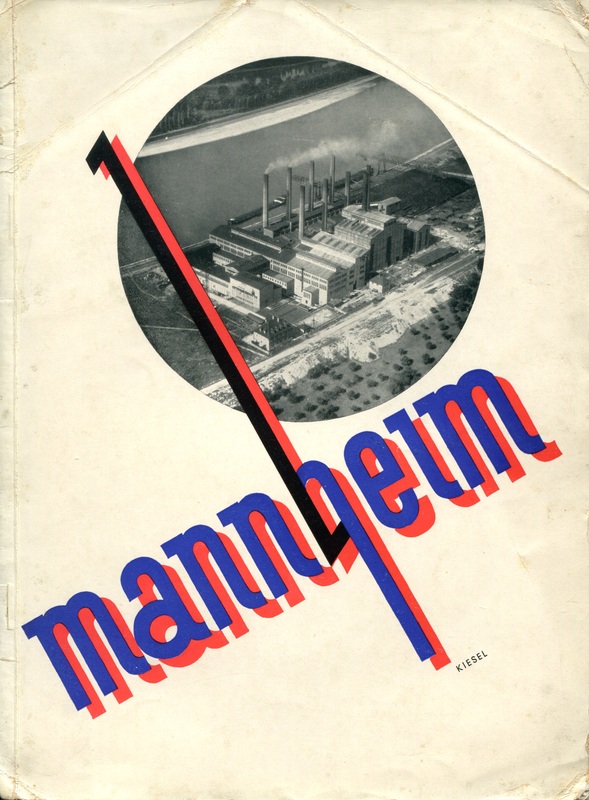 Nevertheless, he devoted space in his baggage for several copies of the publications he edited for the city of Mannheim. He used these publications as samples of his work, and they helped him get jobs when he was starting out here in the United States. This is how we traveled — our campground on the Yoho River in the Canadian Rockies. My parents, Johannes and Elfriede Hoeber, arrived in Philadelphia from Nazi Germany in 1939. They were both 35. Even before they arrived, they dreamed of seeing the America they had read of for so long. As a new immigrant, my father’s income was very limited in the early years here, but he and my mother figured out that if they camped and drove when they traveled, then the only cost above normal living expenses would be for gas. Starting in 1947, when I was four and my brother Tom was five, we took a camping trip every summer for twelve years, so that by the time I was sixteen we had been to all 48 continental United States, a great many of the National Parks, a lot of Canada and a big piece of Mexico. My sister, Susanne, was a good bit older so that most summers she was working or in college or married, though she did come on two of the early trips. We drove thousands of miles on each trip, in an era when there was no such thing as Interstates and cars weren’t air conditioned. 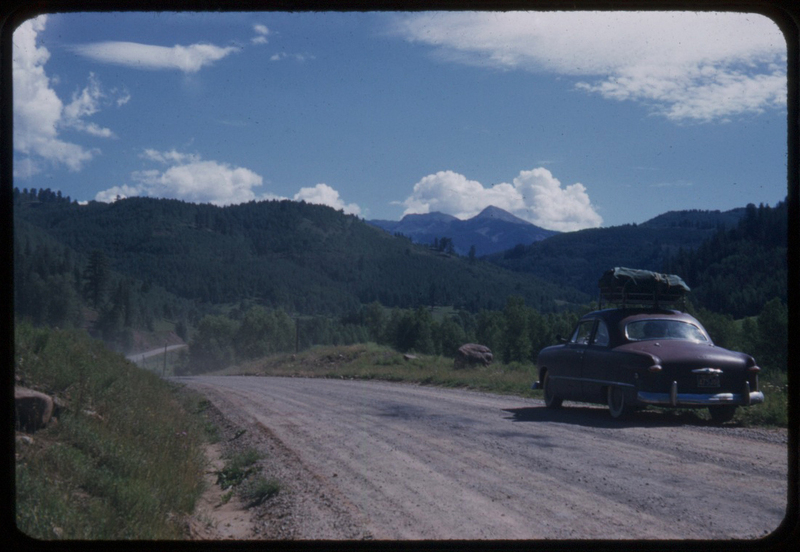 On the road to Telluride Colorado, unpaved in 1958. Our first trip was from Philadelphia to the Great Smoky Mountains in Tennessee, and over the years we hiked in the Rockies and the Cascades, swam in the Mississippi River and the Pacific Ocean, and studied the sites of the great events of American history. What sticks in my memory most, however, were the days and days of driving as we crossed the country so many times. We would start early in the morning, with my father driving and my mother navigating from the Rand McNally road atlas. Our first errand was to find an ice house to buy a chunk of ice for our little cooler and perhaps some white gas for our Coleman stove. I will never forget the excitement of reaching the Mississippi on our third or fourth day out, or driving hour after hour across the wheat fields of Kansas, or the rolling grasslands of South Dakota or the amazing deserts of Utah and Nevada. We froze as we camped in the cold northern reaches of Alberta and roasted when we drove through Death Valley when it was 123 degrees in the shade with no air conditioning. At lunch, we would stop at some county seat because my mother figured out there was a small park in front of every county courthouse, even in Nebraska or Montana, where we could sit on a bench in a patch of shade while we made sandwiches out of the icebox. 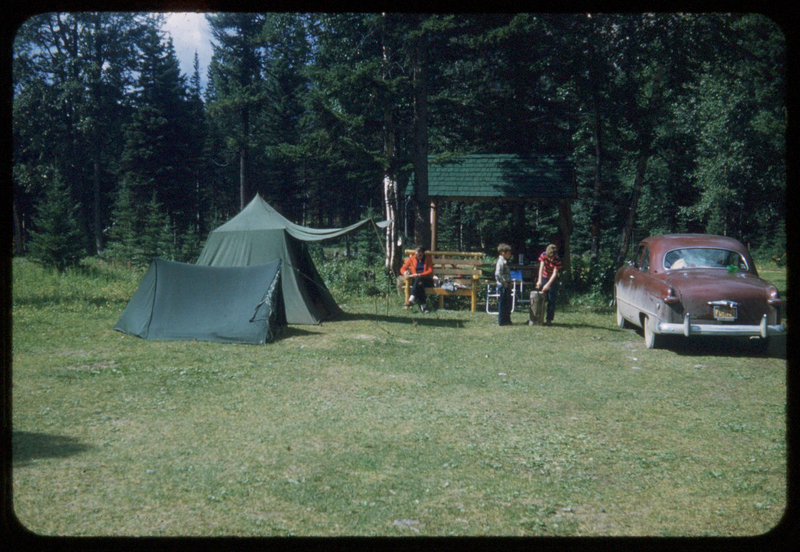 At night we would find a campground and my father and my brother and I would unpack the equipment from our car roof carrier and set up the two tents while my mother made dinner on the camp stove. Dinner was plain — perhaps hot dogs and sauerkraut and canned potatoes, with canned fruit for dessert — but they tasted wonderful in the open air of some new place. I never remember having trouble sleeping on the ground after the full days on the road. And the next morning we would start our adventures all over again. 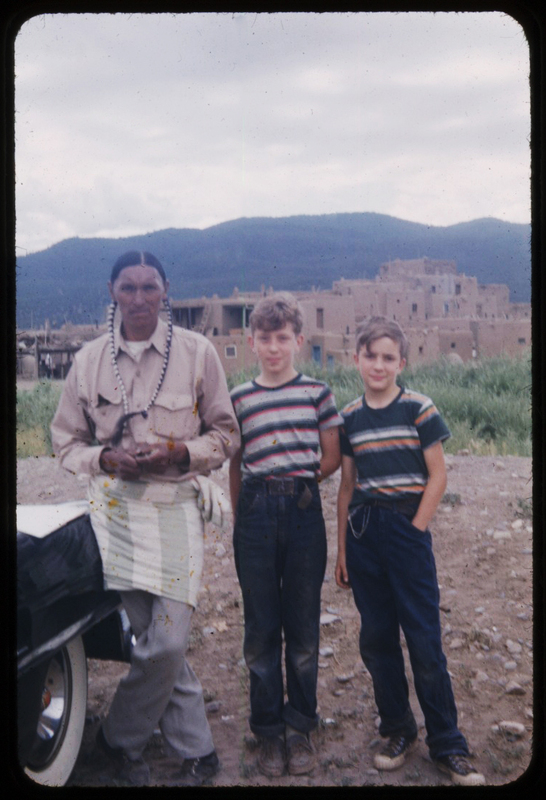 Tom (center) and Frank (right) with the Governor of Taos Pueblo, NM, 1953. My parents’ life as new Americans was not always easy, but I never knew them to be happier than when we were all on the road together discovering the corners of this wonderful country. 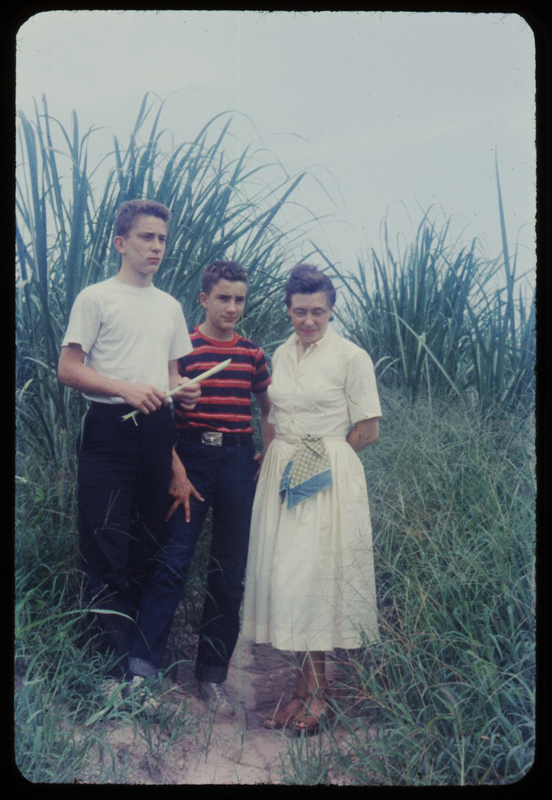 Tom, Frank and Elfriede in a sugar cane field, Baton Rouge LA, 1956.